Tempin Concrete Construction specializes in all types of concrete work—from new construction to remodeling concrete—and additions as well. 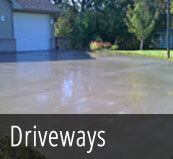 We offer block foundations, basement floors, garage floors, steps, sidewalks, patios, concrete driveways, and pole barn floors. 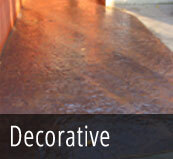 We offer traditional finish as well as decorative concrete finishes (stamped and stained concrete). 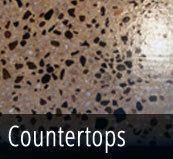 Templin Concrete also produces and installs custom concrete countertops for your kitchen, bathroom, or outdoor patio. The concrete countertops are constructed in the shop. The mold is built from templates taken from your house. The concrete is colored (optional), then poured into the mold and allowed to harden. The countertop surface is then polished to a glassy smooth finish. Next we seal the countertop and carefully transport it to your house for installation. From the first call you will get a free estimate, either by a home visit or over the phone pricing. Your project is then scheduled. Once the project is complete, payment is due. Occasionally, we will ask for half-payment down before beginning the job (at the owner’s discretion). 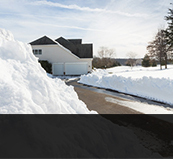 We also offer residential snow plowing at an affordable price. Call for availability. We will make a one-time trip or recurring trips, depending on your needs.